In November this year we wrote about the need to replace SSL certificates issued by Symantec Group (incl. RapidSSL, Thawte, Geotrust). Today, we are supplementing this information with dates. 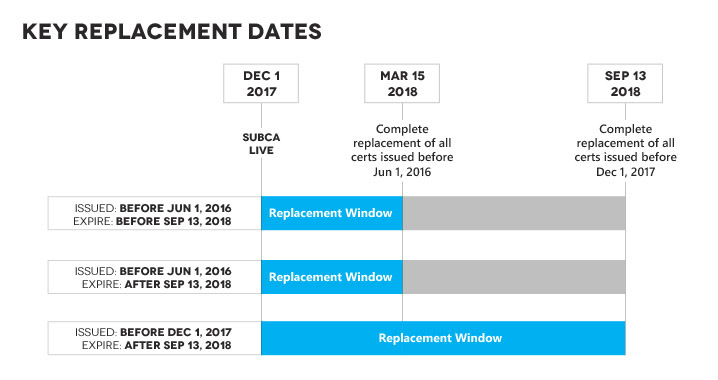 The deadline for replacing the certificates again depends on when they were issued. Below we present the time frame. After these dates, certificates that do not undergo reissue procedures will be misdiagnosed by the browsers. If you are our customer, read the newsletter, which contains detailed information. Follow our blog and stay up to date with changes in Symantec.